When I talk about Men’s beading patterns I could take two different angles. I might want to consider beading patterns that are perfect for men to make. Or I might want to consider beading patterns that make gifts that are ideal to give to men. In a world where we aspire to gender equality, there is an inherent danger and bias in even mentioning the term ‘Men’s beading patterns’. Why should there be a distinction between the genders? There shouldn’t. 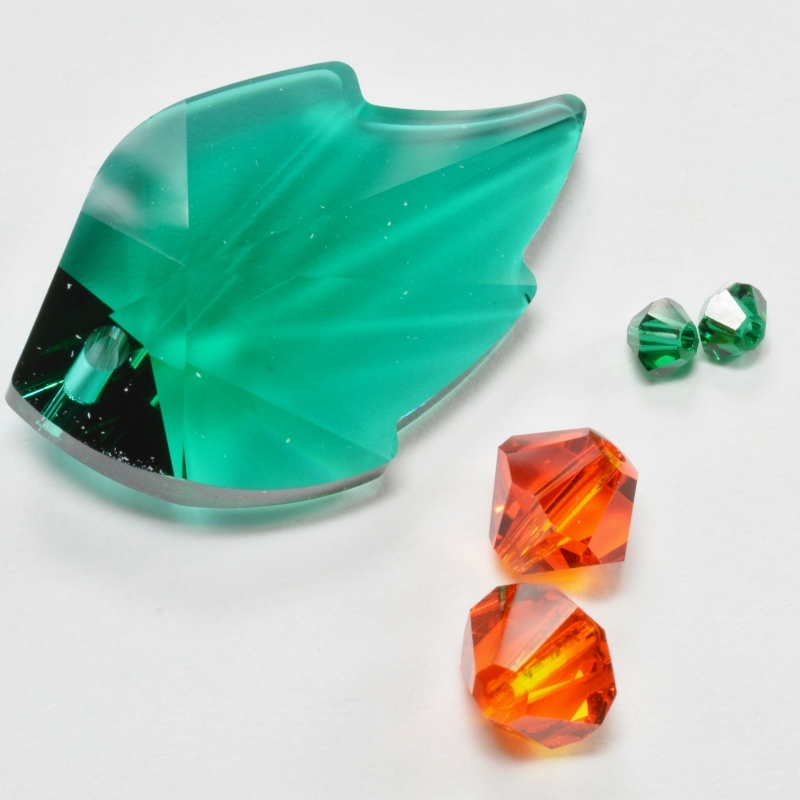 Beading is not just for women, so if you are reading this and wanting recommendations to get started, then forget the gender difference and follow the same advice that I would give anyone. Try a few different techniques – you can read about most of the main ones here – and decide what you like and enjoy. Start off with beginner level patterns and gradually build your skills and confidence. You might want to try some classes, or if there are no classes near you (or you feel shy! ), then you can find lots of free tutorials and good YouTube videos to help you. The projects that you decide to make will depend entirely on your taste and needs. I say ‘your taste’ if you are making projects that you will wear or use (remember, beading doesn’t have to be all about jewellery!). If you are making gifts for other people, then you will need to consider what they are going to like as well as what you enjoy making. What I really want to write about is sharing some ideas for projects that are suitable to give men as gifts. 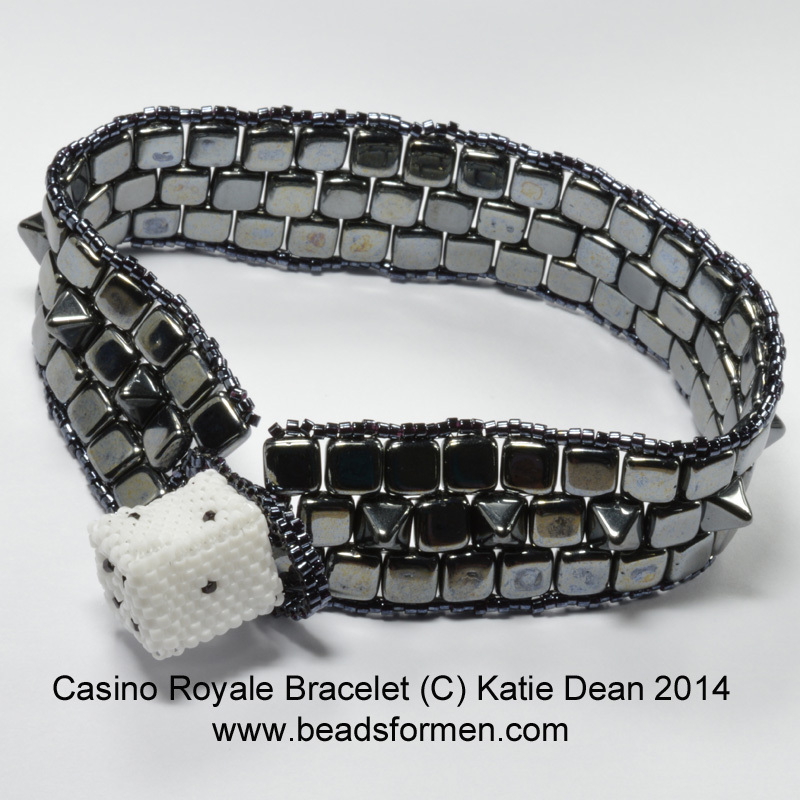 I’m not suggesting that jewellery is unsuitable, but if you want something a little different, then try these ideas for men’s beading patterns. If you know my work already, then you will know that I started out by learning how to do French beading. Traditionally this technique is used for making flowers. I soon learned to turn my individual flowers into bouquets, pot plants and arrangements. My Mum still has lots of my beaded flower arrangements around the house, but I wasn’t quite so sure that my Dad or my brother ‘needed’ very floral arrangements on their desks at work! Not to be deterred, I began beading some cacti and bonsai trees. Both my cacti were in flower to be sure, but they seemed just a little more masculine than say, a cyclamen! If this sounds like the kind of thing you want to try, then you can find the pattern for the small oval cactus here (I believe it’s called a Rebutia, technically!) and the Prickly Pear here. The Bonsai Tree pattern is here. For another unusual idea, how about a pen? 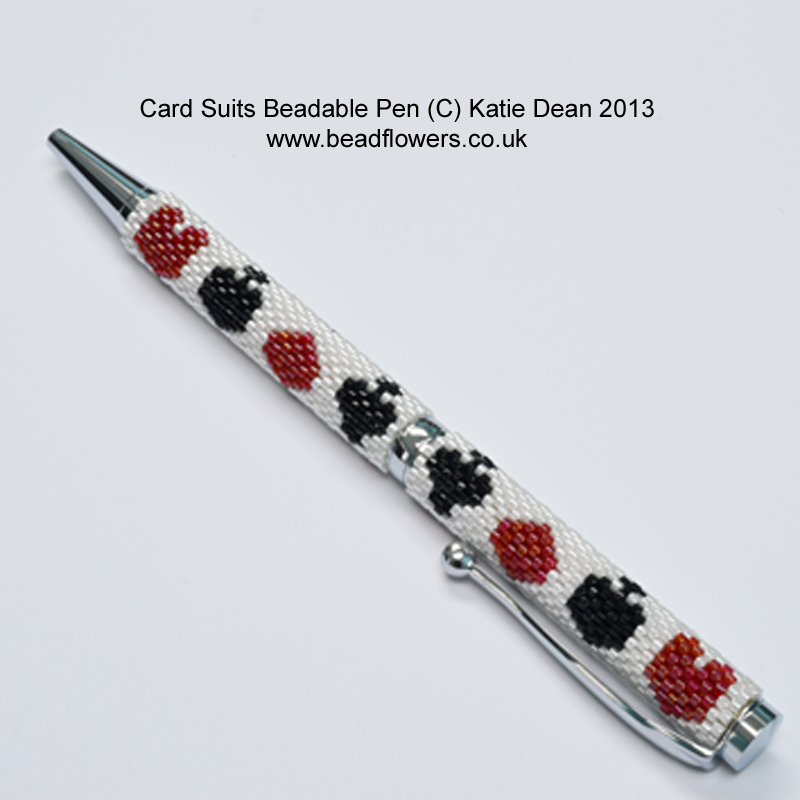 How do you bead a pen, you m ay ask? Well, you can buy pens that are specially made with an indented body that you can fill with a beaded material. There is really no restriction on the type of beading that you can use, but I like to create little Peyote stitch strips to wrap around my pens. So, in these Men’s beading patterns, I’ve done all the hard work in calculating how many beads are required to make the perfect fit. 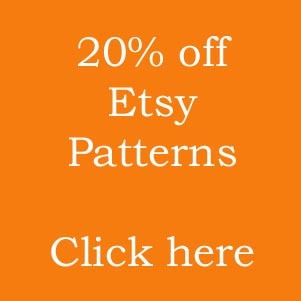 I’ve also designed a c ouple of patterns for you, so all you need to do is bead them! 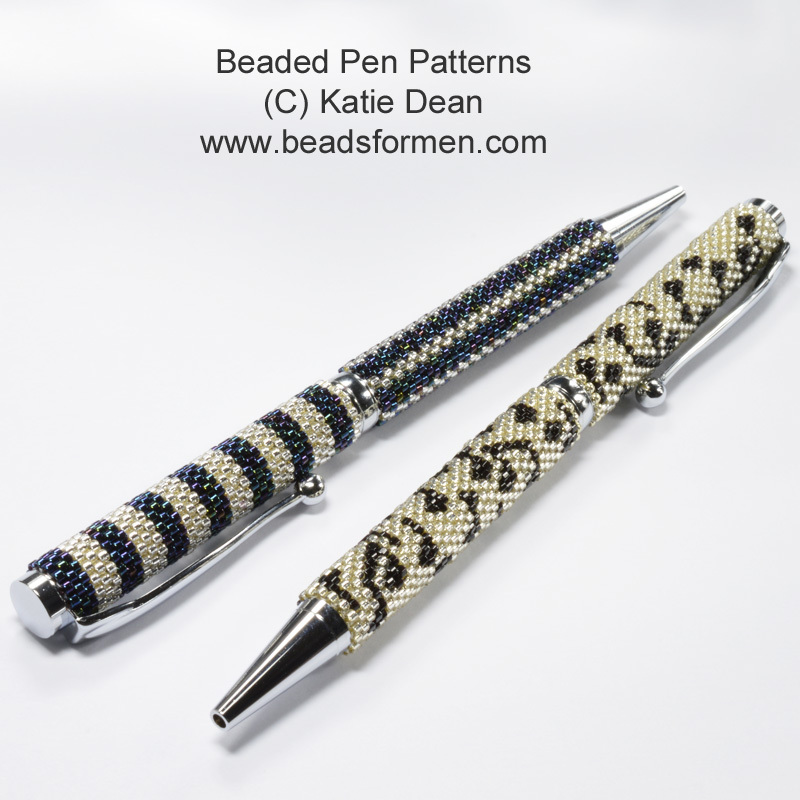 If you need any help in following the patterns, then you can recommended beads, otherwise the beading won’t fit your pen! 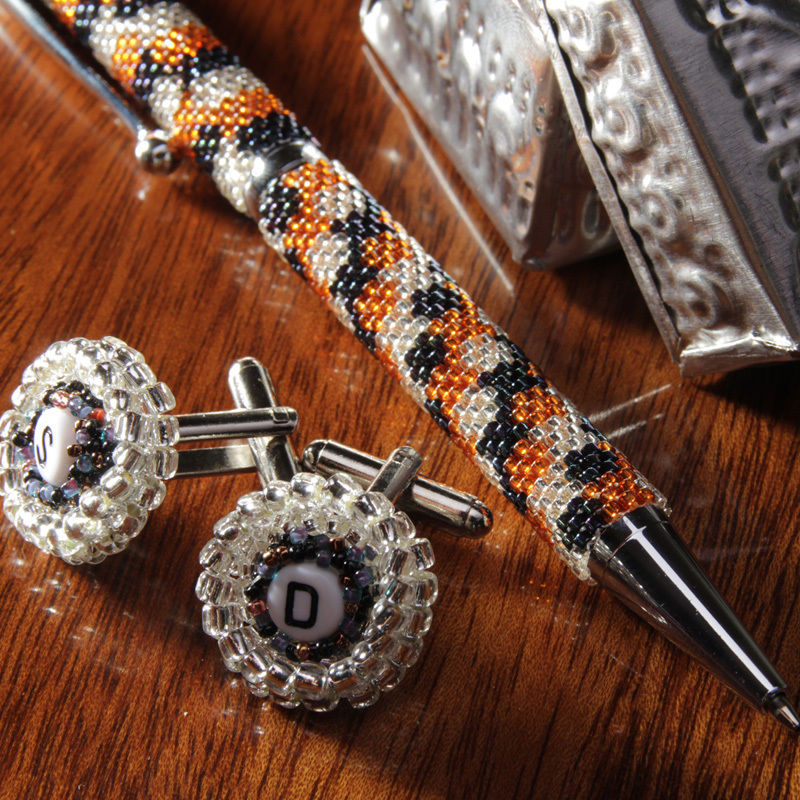 Last, but not least, cuff links are a good option for beaded gifts for men. 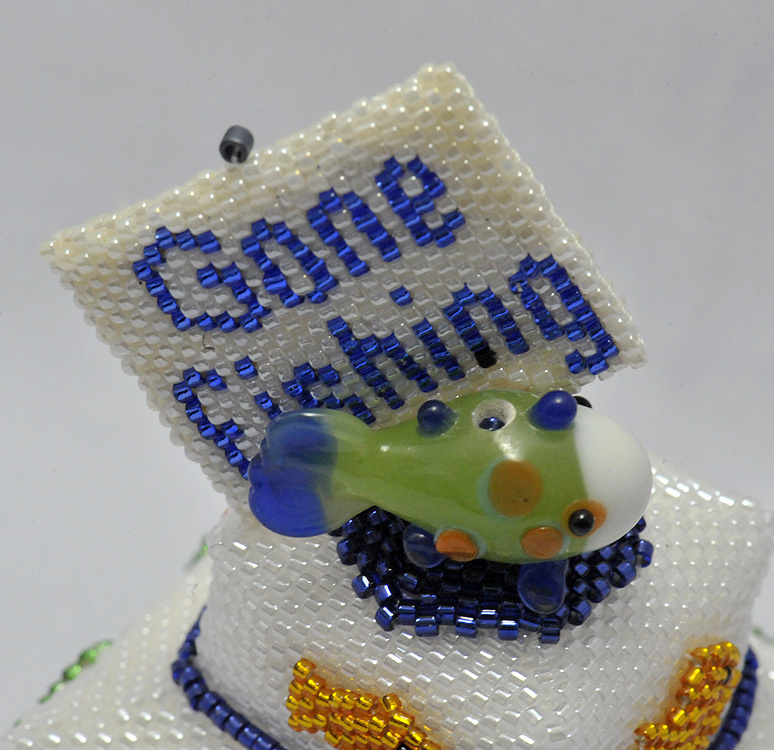 You can eit her buy cuff link backs onto which you can bead, or why not create your own? The design possibilities are endless. As you saw in the main photo, I have created designs that incorporate initials. 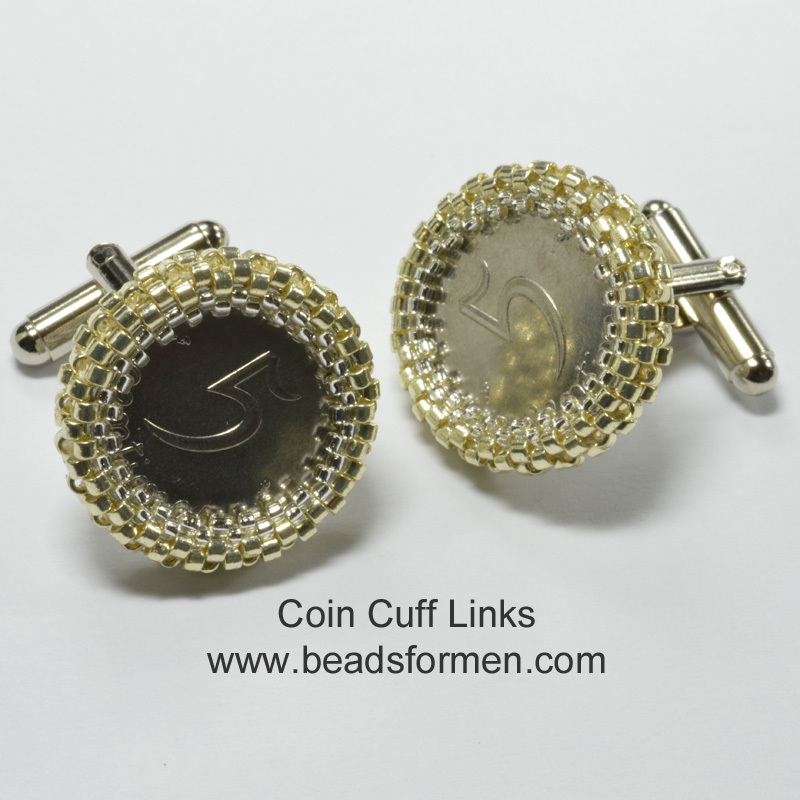 I have also used old coins to make a pair of beaded cuff links. 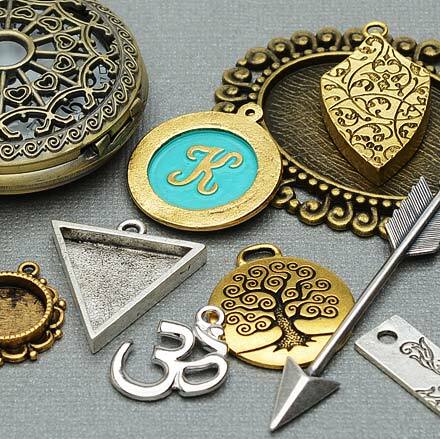 Any square or circular shape will work, provided it is the right size, so you can create your own designs as well. I suggest size 15 seed beads are good for this kind of project because they are small enough to allow you to create small scale patterns and shapes. Whenever I have written books with designs for occasions, I have made sure to include Men’s beading patterns as well as projects for women. If you want something special for a birthday or Father’s day, then you can make beaded cards. I don’t mean just paper cards with a beaded decoration – oh no, I’m talking about a complete miniature card made entirely from beads! In my Beaded Keepsake Cards book, I focused on the elements of the basic card, giving lots of ideas for personalising or creating new designs, so take a look if you need to commemorate a special event. 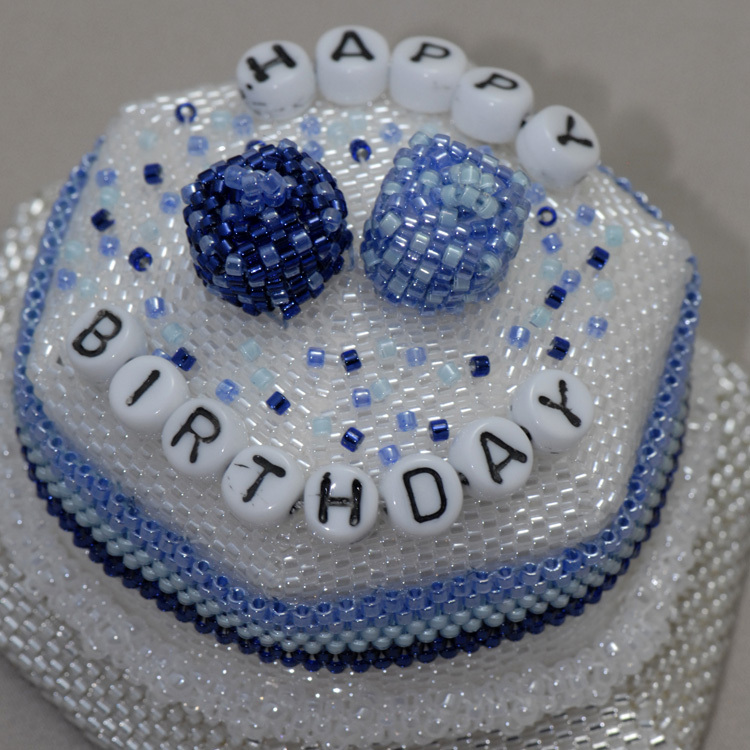 Why stop at just a card, when you can make a full beaded cake? I’ve made quite a few beaded birthday cakes for men over the years. 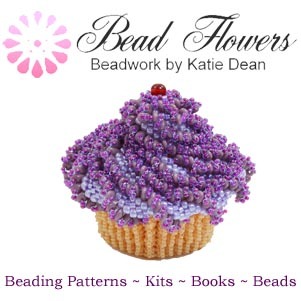 I included some of my designs in my Beaded Cakes in Miniature book. I also created some gifts in my book, Beaded Christmas Gifts and Cards, so that may give you further inspiration. If nothing else, I hope I have convinced you that you can use your favourite beading techniques to make a lot more than just jewellery. As with all good beading patterns, these should be unisex and, as I write this, I want to leave you with one more idea. There really should be no need to create distinctions between what is ‘right’ and ‘wrong’, ‘good’ and ‘bad’, for someone based on their gender. It looks like this is a lesson my little niece is learning early on: her current favourite toy is a ride-on Thomas the Tank Engine. It would be good to think that she can grow up in a world where she’s just as likely to become a train driver as learn (from me) how to bead! 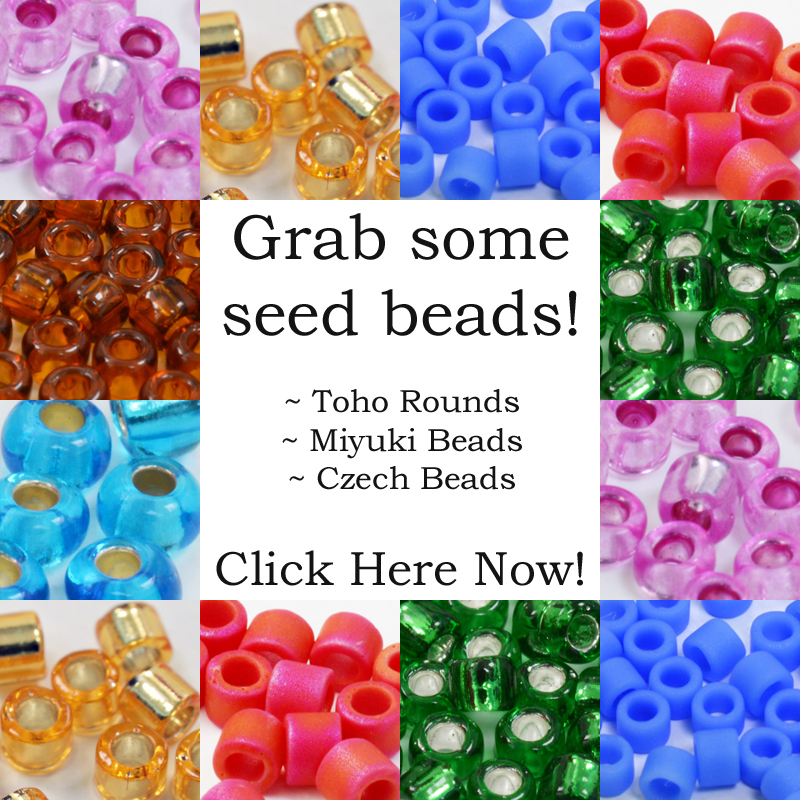 Claim a £5 beading pattern for free – click the image! My World of Beads © 2019. All Rights Reserved.